Truth be told, I’d take shortbread biscuits over all other biscuit-kind for the simple reason that as well as being deceptively indulgent, they are also incredibly fragile and, dare I say it, fleeting. The dough barely holds itself together, you bake them to the palest shade of gold and you know that the minute a piece of shortbread passes your lips, you have a matter of moments before it melts away – and that’s the trick, it is the very definition of short and sweet. Sieve together the flour, salt and sugars and then add the cold butter cut into cubes. Rub the butter in using your fingertips until you have a mix that resembles fine breadcrumbs. This will take a little while, but stick with it. Add the vanilla and the egg yolk and bring the dough together gently with your hand. The barely-there texture of shortbread that we all love is a result of how gently you work the dough, so the bare minimum to bring the dough together into a ball is all you need. Roll the dough out onto a floured surface to a thickness of around 2cm and cut out your rounds using the cutter. The biscuits now need to chill in the fridge for 2 hours before you bake them. The high butter content in the dough means that it needs to firm up again after all that rolling so that the biscuits will keep their shape. Preheat the oven to 180ºC / Gas Mark 4 and bake the biscuits for 10-12 mins max. You are looking for them to barely colour around the edges. Leave them to cool on the baking tray for 5 mins and then transfer them to a wire rack. While they are still warm, sprinkle over a generous pinch of caster sugar. 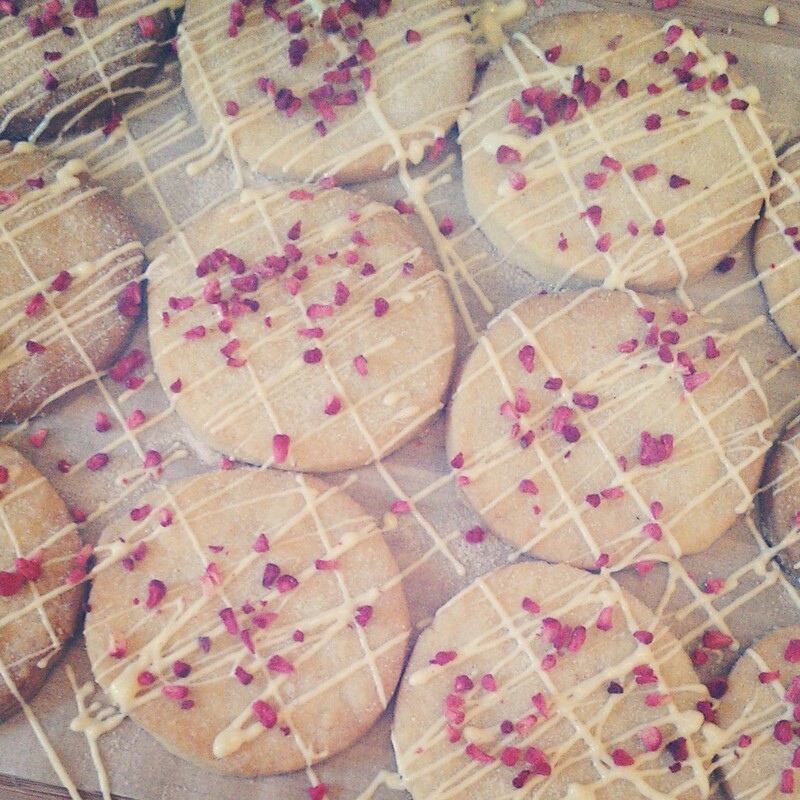 Once the biscuits are completely cool, melt the white chocolate and drizzle it haphazardly across the shortbread and then finally sprinkle over some freeze-dried raspberries. This entry was posted in Biscuits and tagged biscuit recipe, biscuits, raspberry recipe, shortbread, shortbread biscuits, shortbread recipe, white chocolate recipe by Natalie Glock. Bookmark the permalink.